Heat oven to 350°F (325°F for dark or nonstick pan). Grease bottom only of 9-inch square pan with shortening or cooking spray. In small bowl, beat Filling ingredients with electric mixer on low speed until smooth. Set aside. Make brownie batter as directed on box. Spread three-fourths of brownie batter in pan. Spoon filling by tablespoonfuls evenly onto brownie batter. Spoon remaining brownie batter over filling. Cut through mixture with knife several times for marbled design. Sprinkle with chocolate chips. Bake 40 to 44 minutes or until toothpick inserted in brownies 1 inch from side of pan comes out almost clean. Cool completely, about 1 1/2 hours. For 16 brownies, cut into 4 rows by 4 rows. In each dessert cup, place 1 brownie, ice cream and strawberry slices. Serve immediately. Softening cream cheese is easy. Just microwave unwrapped cream cheese in a microwavable bowl uncovered on High 10 to 15 seconds. Store brownies covered in refrigerator. A brownie classic! 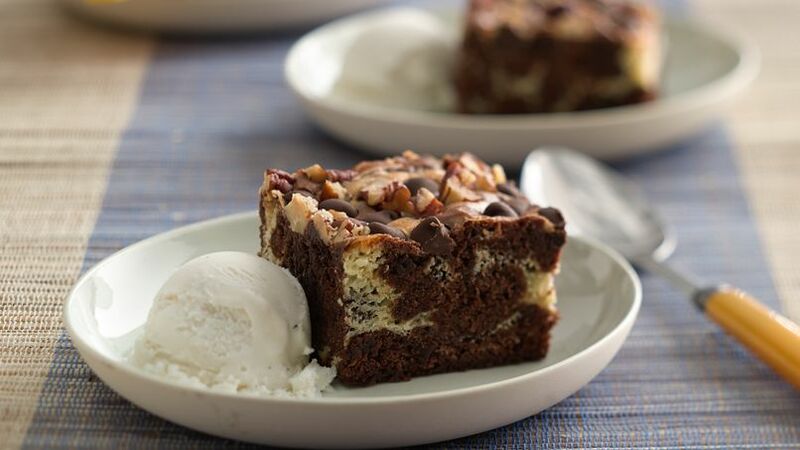 Who can resist rich cream cheese swirled through rich fudgy brownies?